In 2014, Dutch student, Shawn Buckles, set up an online auction to sell off his personal data to the highest bidder. Every bit of personal information went up for sale, including, location records, travel records, his personal calendar, email conversations, online conversations, browsing history, and his shopping preferences. Eventually, Shawn sold his digital soul for $418 to technology news company, The Next Web, who presented this data at a conference dedicated to privacy related issues. The year prior, in 2013, The Financial Times created a system to calculate the precise dollar value of a person’s personal data, which as it turns out, can be had for the bargain basement price of a mere dollar. Apparently our Dutch student, Shawn, made out like a bandit when he sold his personal data for $417 over the going rate, while the rest of us are only worthy of 99-cent store prices. *Thud! * Pardon me, that was the sound of my self-esteem hitting the floor. The value of your personal data is directly related to your career and lifestyle. For instance, an entrepreneur or chief executive’s personal data is worth more than a day laborer, while someone with acid reflux, ADHD, allergies, asthma, or clinical depression, will fetch top dollar from pharmaceutical advertisers. 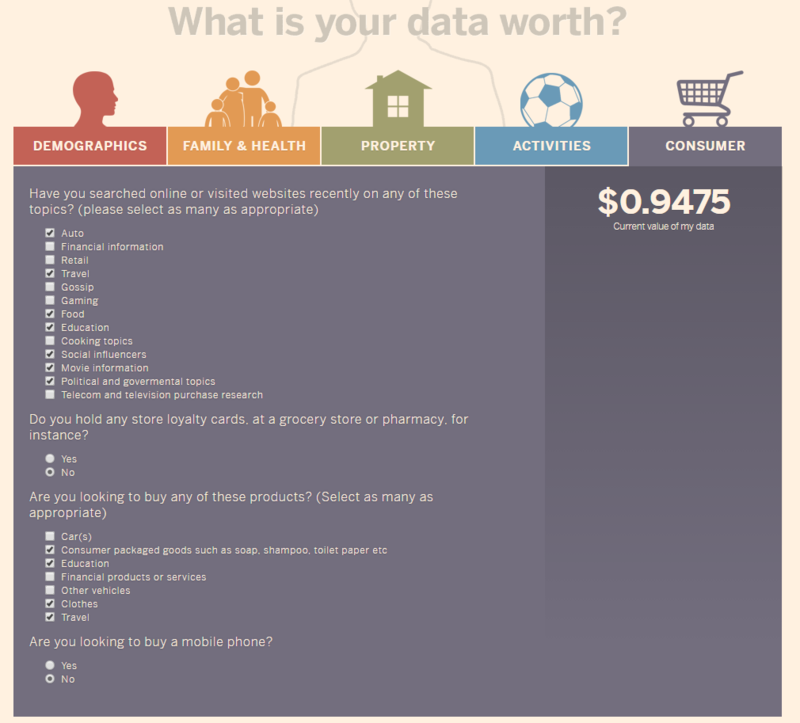 Any property you own or recreational activities you enjoy also impact the dollar value of your personal data. Those in the businesses buying personal data purchase dossiers detailing every aspect of your life, such as, health ailments, credit scores, even due dates for expectant mothers. Adding insult to injury, this violation of your right to privacy is often sold for mere pennies. Data brokering is a volume business. The more records a data broker has at their disposal, the more accurately they can predict consumer behavior, making data harvesting a valuable commodity. This massive amount of data is then sold to marketers and advertisers who use it to target products and services to you, the consumer. Sometimes junk mail is exactly that, but sometimes, you get an advertisement and marvel at how relevant it is to your specific circumstance personal interests. “Wow! This is exactly what I’ve been looking for!” – sound familiar? Some coincidences aren’t actually coincidences, they’re meticulously crafted ad campaigns infringing on your privacy by using personal information purchased from a data broker. 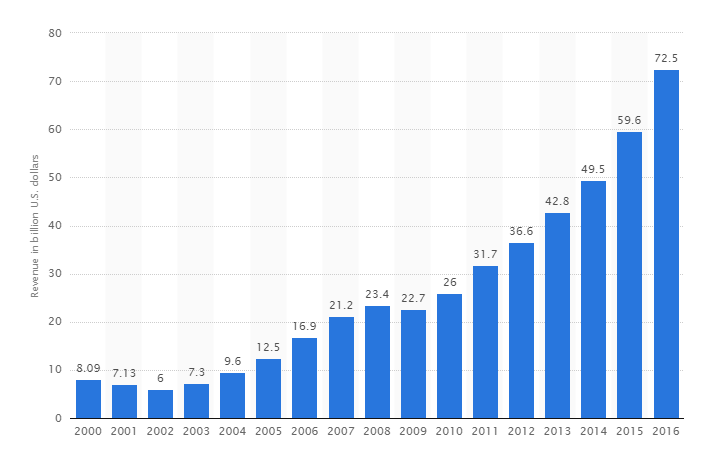 The following graphic charts online advertising revenue in the United States from 2000 to 2016. In that sixteen year spread, the total spent on online advertising in the U.S. increased 9x, topping out at 72.5 billion dollars, up from 59.6 billion a year earlier. In 2012, the data broker industry generated $150 billion in revenue. Just imagine how much they’ll make today. The Federal Trade Commission (FTC) revealed three types of marketing products: (1) direct marketing, which includes postal mail, telemarketing, and email marketing; (2) online marketing, which includes marketing to consumers on the Internet, via mobile devices, and via cable and satellite television; and (3) marketing analytics. In addition to detailed reports, data brokers also sell marketing lists. As a rule, these lists share a specific set of interests, such as, parenting, pregnancies, geographic locales, or people who own a model car. Based on these lists, businesses know how to reach their target audiences and promote their products more effectively. Some data brokers sell risk mitigation products which help generate a lucrative revenue stream. According to FTC, these products can be divided into two categories: identity verification and fraud detection. For example, data brokers offer products that indicate whether an email address has existed for a period of time, or has a history of transactions related to it. Data brokers often post vulnerable personal data without your consent, leaving this information at risk of falling into the wrong hands. To prevent any negative consequences, you need to actively take steps to safeguard your private data. You can request data removals yourself or leave the heavy lifting to a privacy management company like OneRep. Whatever avenue you choose, don’t delay, start maintaining your online privacy today! For the most part, going online is basically free, however, as any mouse will tell you, there’s also free cheese in every mouse trap. The unsolicited sharing of your personal data is the price we pay for a free internet, and it’s up to us to protect ourselves against the traps inherent with surfing online. Previous PostPrevious How Does Your Personal Data Appear on Countless Websites?